Our Stranger Things Lesson Bundle is available exclusively to members of the TeachArgument Community. Click here to join now! If you haven’t watched Stranger Things yet, do yourself a favor and plug yourself into the nearest Netflix pipeline to burn through ‘season one’ before reading any further. If you have watched Stranger Things, you’ll be very happy to know that we’ve answered one of your most recent burning questions: How can I use ‘Stranger Things’ in my English classes? But before we begin, is it worth repeating the importance of studying popular media, of making core language arts skills relevant to students through modern texts they’re deeply interested in, of explicating well crafted works of film that warrant as much or more literary merit than many of the books in our dusty book rooms? All common sense at this point? Okay. Let’s get started then. For those of you who haven’t yet had your brains melted by AP English and/or who are not yet acquainted with the term, a pastiche is an artistic work in a style that imitates that of another work, artist, or period. Those little imitation-based writing tasks you ask your students to engage in? There’s a little pastiche in there. Those awesome Writing With Mentors exercises? There’s a little pastiche in there, too. Stranger Things is a pastiche of 1980s horror, and pays homage to works of the likes of Stephen Spielberg and Stephen King. In this sense, it’s an incredible gift to English teachers – because it’s unadulterated proof that those writing assignments can pay off big, and because it serves as a wonderful model of how awesome (and non-corny) pastiche can be. To put this into practice, simply ask students to craft pastiches of their own, drawing from the authors, filmmakers, video games, and/or works that they are most passionate about. Conversely, Stranger Things offers us a third option: to teach allusion in a context that modern viewers can appreciate! When Dante embedded allusions to a smorgasbord of popes into Inferno, he was [arguably] writing, foremost, for his a audience that would understand and appreciate those allusions… (and, perhaps, also to memorialize those notions for future generations, too). In Stranger Things, the Duffer Brothers pay homage to a host of popular 1980s phenomena, ranging from Star Wars to E.T. to John Carpenter. While these allusions will not be at the forefront of your students’ minds (…we’re getting old…), they are certainly fresh enough to inspire engagement. To bring this to life in your classroom, simply ask students to identify as many of these references as possible before directing them to a thorough compilation, such as this one. Then, discuss the purpose and impact: Why pay homage? How do these homages make us feel? Do different audiences react differently? Do these allusions hone in on a particular audience in any way? Does this strengthen or weaken the appeal of the series? The episodes aren’t episodes. They’re chapters. And there are eight of them, literally titled: “Chapter One: The Vanishing of Will Byers,” “Chapter Two: The Weirdo On Maple Street,” “Chapter Three: Holly, Jolly,” and so on. If you teach in a school with no standardized tests, standards, or rules, you can get away with screening the series in class and engaging your students in a close analysis of plot development. As for the rest of us, well, we can draw heavily from the short clips, episode summaries (such as those found on Wikipedia, here), and the chapter titles themselves. Ask students to develop infographics using their understanding of the plot trajectory, to compare this trajectory with others of more and less successful series, and to reinforce the makings of sound plot structure. If you’re feeling particularly feisty, you might even ask students to repurpose the plot trajectories they’ve developed as tools for writing… combined with the recently released titles of “Season 2” (e.g. 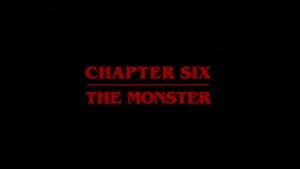 “Chapter 1: Mad Max,” “Chapter 2: The Boy Who Came Back To Life,” “Chapter 3: The Pumpkin Patch,” etc.). Whether you’re looking for avenues to teach authentic voice, plot structure, or darn-good-writing, this is an awesome framework to pursue! This is a visual medium, people! Visual rhetoric is key! Every frame, every angle, every interplay of light and dark – all of it – matters. Start with the title screen – that glowing red font that harkens back to the eighties. Who made the decision to move forward with it? Who is it designed to tantalize? Whose interest will be most piqued? What message does it send? What is the argument embodied in this title screen alone? Then, move on to popular shots – the Star Wars-style promotional poster, the kids on their bikes with flickering headlamps, the dim glow of Christmas bulbs strung over a distressed Winona Ryder – but take the time to explicate, to analyze, to peel back the layers with every single one. Our Stranger Things Lesson Bundle is available exclusively to members of the TeachArgument Community. Grab these resources (and heaps more) while collaborating with likeminded and brilliant English teachers! Click here to join the TeachArgument Community now! Want to receive our free and awesome English teacher resources in your inbox all year long? Sign up below! I love your materials ,but I teach 6th ELA and most things t I receive are secondary level. Do you have any that are a lower level? Hi Anne! Glad to hear that you’ve enjoyed our materials! We typically design our materials with rigor in mind because teachers have found “dialing it down” to be substantially easier than “dialing it up” — but, that being said, we often build lessons that are middle school ready, out-of-the-box. I’d encourage you to check out the new Weezer lesson, the [relatively new] Pokemon Go lesson, and some of the older pop culture lessons (i.e. Taylor Swift and Nick Jonas). Hope that helps!